Tell us about your typical commute. 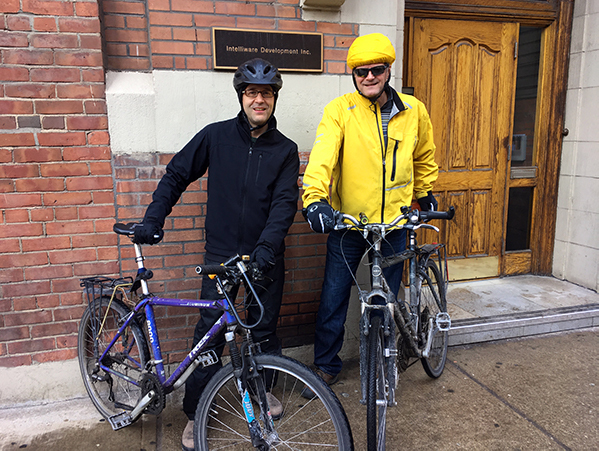 Mine is a fairly short trip – riding from The Annex to our office Downtown. There are numerous options with bike lanes; the Bloor St. lanes are almost always cleared and salted, which makes traveling on them easy. During winter, I usually use a Bike Share bike rather than my own, which gives me the flexibility to take public transit if the weather conditions change dramatically and I don’t want to ride home. I commute from the Bloor West Village area on a regular basis, rain or shine, winter or summer. It’s roughly 10 km each way, which takes 30 to 40 minutes. My commute acts as an excellent transition to and from work that ends with a refreshing shower (thanks to great facilities at work). There’s rarely a dull commute including positive interactions with other cyclists, pedestrians and motorists and the odd difference of opinions, expressed as respectfully as possible. I ride in from the Beaches. In sunny weather I’ll try to stretch it out and will follow the Martin-Goodman Trail down to Leslie and Cherry Beach then come up Cherry to Queen’s Quay. I then ride up Lower Simcoe to the office. Why do you ride in the winter? Just like in the summer, riding a bike to work is the most convenient and reliable way to go. It’s also flexible in case I want to run an errand on the way home. I ride in the winter for pretty much the same reasons as in the summer: it’s good exercise, preferable over taking public transit, and more predictable. In the winter, in particular, I enjoy the energy that you get from cycling in colder weather. 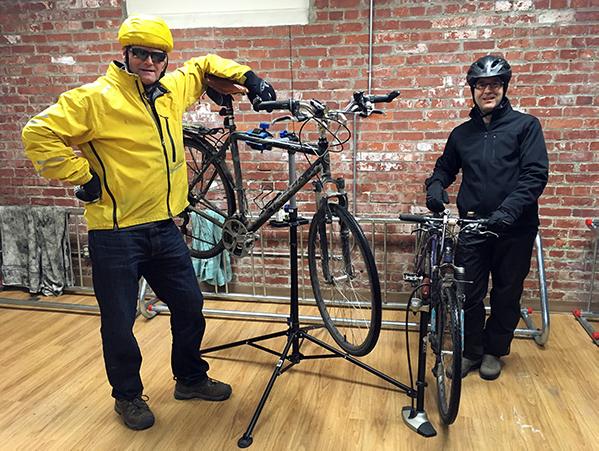 There’s also an implicit camaraderie amongst people who continue to cycle year-round. Same reasons as riding the rest of the year, it’s way cheaper than driving or taking the TTC. I get exercise and fresh air. Even on the coldest days, once you are warmed up, it feels great. How does your riding change in the winter? In the winter, I stick to well used streets, ideally with cleared lanes, whereas in the summer I might vary my route by taking some side streets. I go more slowly in the winter, taking into consideration the road conditions both for myself and car traffic. My commute tends to take a bit longer in the winter as I adjust to the conditions. There are days after a big snowfall when I will not cycle because it becomes less safe and more difficult for drivers as well as cyclists. It’s been a pleasant surprise to me to discover that there are fewer days where this is the case than I had expected thanks to improved efforts by the City to keep primary bike paths clear and clean. What’s one tip you’d share with someone new to winter biking? Dress for the weather – there’s no need to be cold if you dress right. Additionally, I’d emphasize relaxing and enjoying the ride, particularly when the roads are slippery. The one thing I focus on when commuting is conveying what I’m doing to everyone in my surroundings to the best of my ability. This includes lots of eye contact, signalling, communication, avoiding ‘pinch points’ and no avoidable surprise maneuvers. Get the proper gear: shoe covers, waterproof breathable pants and jacket. Take your time especially in snowy weather. Ski goggles are awesome when it’s really cold. Road salt will kill your bike. Use a “beater” bike and do your best to keep it clean and lubed. Top winter riding accessory or bike part? Goretex boot covers, balaclava and lobster gloves and most recently bike pogies for -10C and colder, all play an equally important role in keeping me warm(ish) and making my winter rides enjoyable. Best spot to warm up after a chilly ride? I find that I’m actually pretty warm after riding, so I don’t often seek out a place to warm up. That said, I do enjoy settling in to work with a coffee once I get in. Our office, which has change rooms with showers. Then after you’re changed for the day: really good coffee. What’s one myth you’d like to dispel about winter biking? That winter riding has to be cold and uncomfortable. Winter biking up to and including -20C, with a little bit of preparation and appropriate clothing, is as (possibly more) refreshing and enjoyable as many summer rides. Hopefully, more and more people will figure that out. Have you visited a true winter cycling city? I haven’t, but Toronto is starting to feel like one. I can’t say enough good things about the cleared and salted bike lanes! Got a winter biking tip to share? 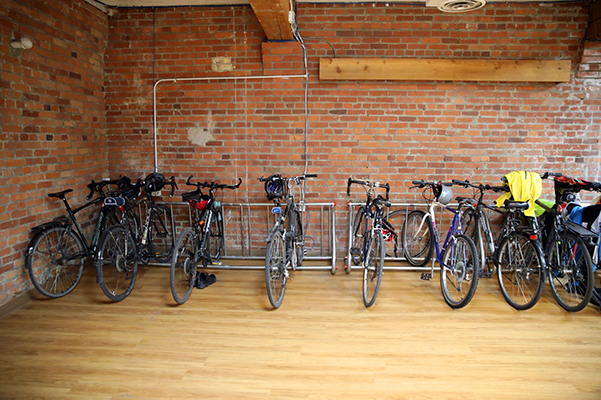 Work in a bike-friendly office? We'd love to hear about it! 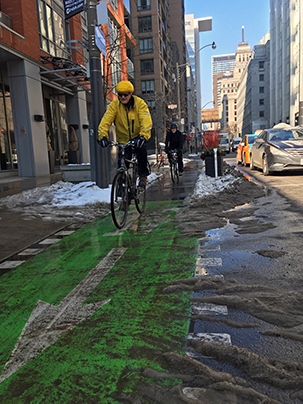 Tag us on social media: @cycletoronto, #bikewinter.